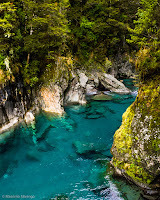 After waking up in our cozy chalet at the Makarora Wilderness Resort, and devouring a filling breakfast (in case we had to skip lunch again), we hit the road back to Te Anau, directed to the Lake Wanaka region. Our first stop was nearby: we left the car a few miles after Makarora and went for a walk in the forest, towards the Blue Pool. 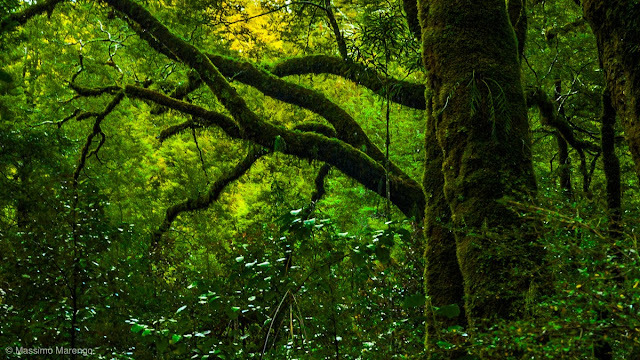 I mentioned in other posts the richness of New Zealand's forests, the perfect set for filming the forests of Middle Earth. This one was no exception. The path to the blue pools is a short walk among huge trees covered with such a tapestry of mosses, that their bark is almost invisible. It is like crossing a tunnel, with the green light filtering between the leaves high in the canopy. It is not a silent forest: birds with voices I never heard before accompanied us along the whole way. Maybe some mysterious Sindarin songs from ages past, or a mockinjay taunting us from a dark future. The path first descends from the road, down into the hearth of the valley, but not so low as the river. 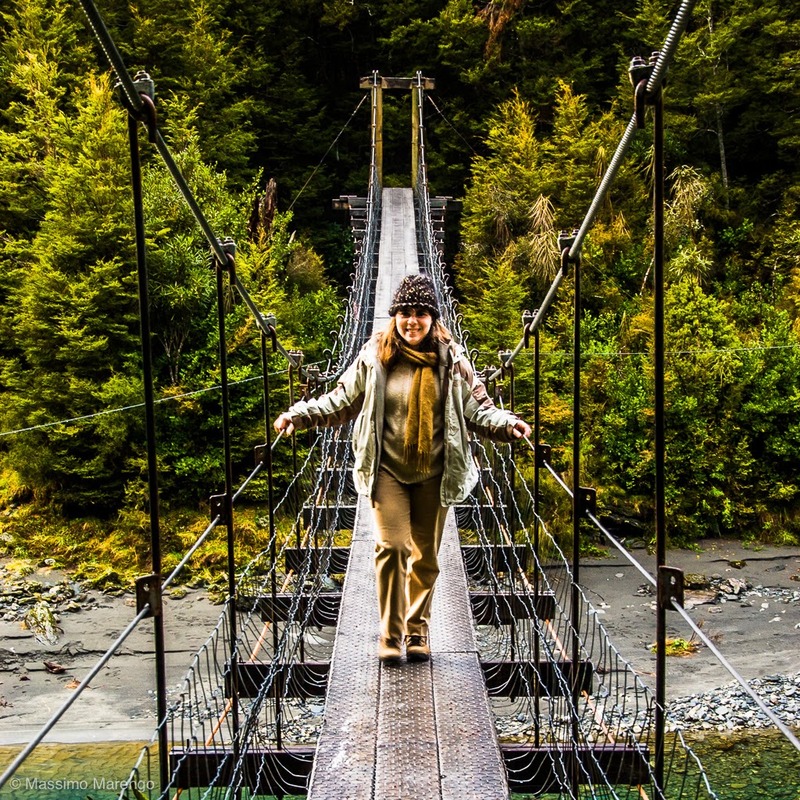 As the photo on the left shows, the crossing is done on a suspension bridge of wood and steel ropes. Not quite as impressive as the rope bridges in the Andes or Himalaya, but still impressive enough that Mayli didn’t want to leave both steel handrails even for the time of the photo! 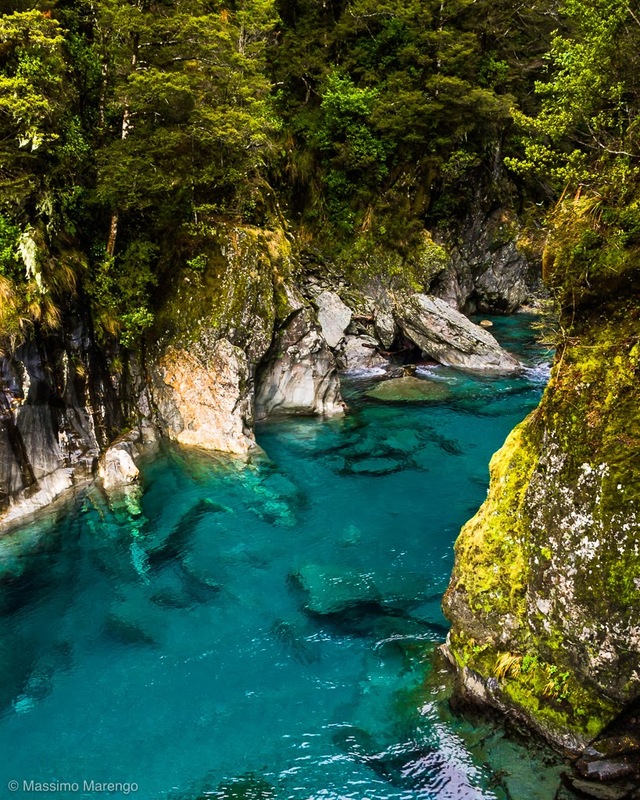 The milky-azure color deep color of the Makarora river is revealing its origin: its water is melted ice from one of the many glaciers in the area. Just after the bridge, the valley becomes wider and the forest more sparse, almost as if we were leaving the Bruinen to reach the gates of Rivendell. The beautiful pool shown in the photo on the right looks was almost unreal, with the water so transparent and so blue that was impossible to gauge its true depth. A few large trouts were swimming in this blue crystal, maybe a few centimeters from the surface, maybe several feet below. We lingered there a little, basking in the sunny day cooled by the winter breeze blowing from the south. 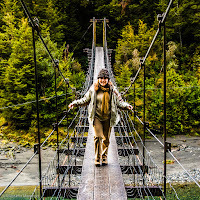 We went then back to the bridge, across the river to the path through the forest, then back on the car, on our way to Lake Wanaka and then south to Fiordland.